DC Power Terminal with Female DC Jack for use with security cameras. Allows termination of any 2-lead bare wire to a DC Jack to connect to a CCTV power supply so you don't have to splice in to the power supply's pigtail and void the manufacturer's warranty. Also great for use with siamese cabling and with a roll of 18awg DC wire. 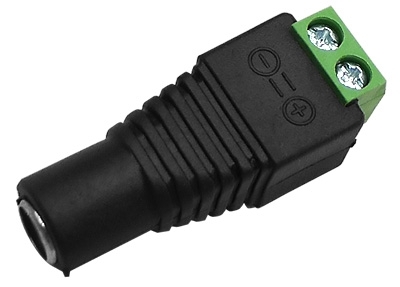 Suitable for use with equipment other than CCTV products as long as the DC connector diameter is the same. If being used outdoors, be sure to insulate the wire terminals from the weather using electrical tape, heat shrink, or inside a electrical enclosure.